If you like reading books on a screen, then e-books are one of the best inventions of this century. 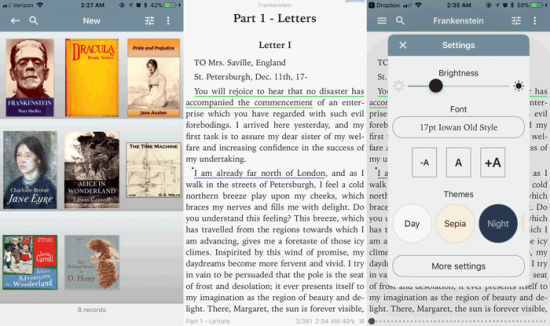 Carrying a library in your purse or pocket is an amazing freedom for avid readers, and display and annotation tools make reading more useful and educational. But outside of DRM-mandated apps like Apple’s iBooks and Amazon’s Kindle, selecting the best DRM-free ebook reader apps for iOS can be a challenging—and highly individual—process. You’ll want an app that you’re comfortable with and happy to stare at for several hours. We tried out a ton of e-book reader apps for iOS and have prepared our opinions on the best of the bunch below. You’ll find something whether you want to annotate everything aggressively or just read in visual comfort. Marvin is our favorite e-book reader, but the free version is kind of annoying. It comes with a persistent “upgrade” banner that you can’t dismiss while reading. But it’s an attractive, capable and well-thought-out reading app with a bunch of unique features in addition to common features like a nearly infinite selection of text customizations and ingesting e-books from Dropbox just as easily as a Project Gutenberg or a Calibre-powered OPDS server. Awesome unique features include extra screen darkening and Flux-like screen warming for late-night reading, Deep View, which reads your book and summarizes all the uses of a character or place name, and Karaoke, which flashes individual words on the screen quickly to enable speedreading (a la Spreeder). Marvin also supports CBX files for comics and a TTS read-aloud function for Siri-powered audiobooks. The highlighting tool is robust but requires a few taps to reveal the complete options. If you want super-easy access to making marginalia, that might annoy you after a while, but highlight-happy readers will find it a good balance. With all the features the app carries, it makes it’s obnoxious “upgrade now” banner a little more understandable, if not forgivable. tiReader has big dreams. 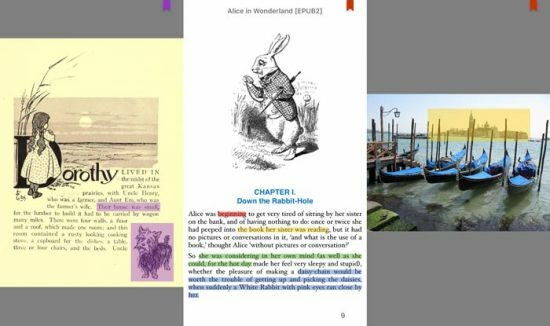 It’s much more than other e-book reader apps: it’s basically an omnivorous media viewer with extensive support for annotation. It handles just about every media type except for videos. 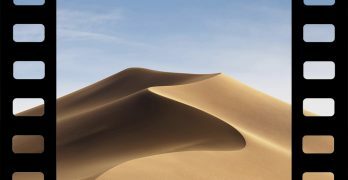 Features include a photo viewer, audiobook player, and DJVU file reader, all with extensive bookmarks and annotations. The annotation tools are extensive and complete. If you love making notes on everything, you’ll find them to be a compelling feature of the app. 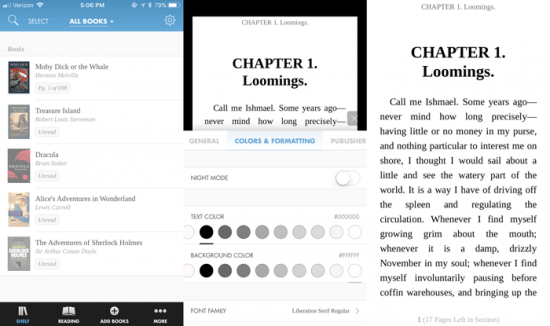 Users just looking for basic e-book reader apps for iOS might be overwhelmed by everything. There’s a lot to tiReader, and if you don’t need all its annotation power, they can make the app feel cluttered. The app’s design could also be a little more modern. tiReader’s user interface has more of a Windows vibe than an iOS feel. For users with their own e-book libraries, you can link to OPDS servers or cloud services like Dropbox from within the application. 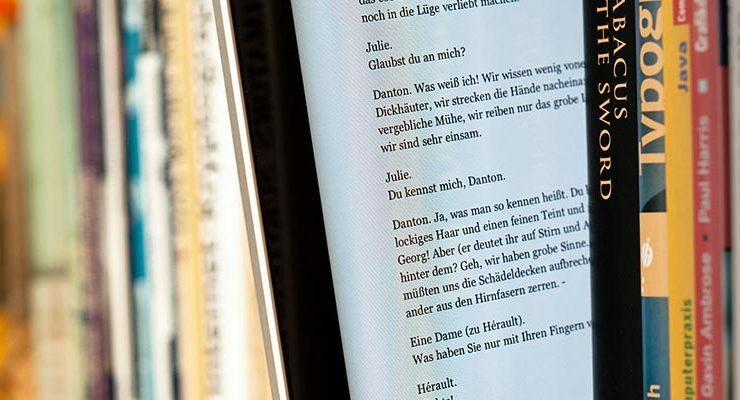 You’ll also find built-in connectivity for free e-book repositories like Project Gutenberg. If you want something that can take it any kind of media and mark it up, tiReader is where it’s at. Kybook 2 offers awesome integration with existing free e-book libraries like Project Gutenberg or your own OPDS server. However, we found that importing your own e-books into Kybook is a little difficult. The app seems designed primarily for hosted OPDS e-book libraries, so copying an ePub from somewhere like Dropbox is a little complicated. But once you get your library set up and load a book into the app, Kybook 2 offers a good reading experience, with strong customization. Dedicated users can apply CSS-based stylesheet changes and load custom TrueType fonts. Minimalistic but powerful highlighting keeps the reading experience visually streamlined. Uniquely, Kybook 2 underlines, rather than highlights, text, and you can customize what the underline looks like on a per-annotation basis. It was also smart enough to automatically organize my Star Wars ePubs into series based on their metadata, which was fairly clever. While we found the library function a little clunky, the rest of the app as well-liked. Hyphen‘s best feature is its classy, modern interface with elegant typographic choices. It’s a pleasure to look at, and the e-book reader app is functional and comfortable to use for long periods. Adding books is easy, with built-in support for OPDS and multiple cloud services. As a bonus, the display can get illegibly dark with a swipe of the finger. This feature is well-loved for late-night reading sessions (especially lying in bed), and it’s a feature we dearly missed in other e-book reader apps for iOS. 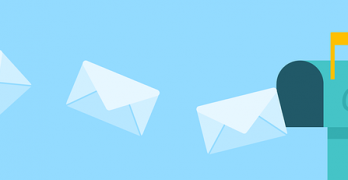 The app’s default color options are essentially infinite, and very picky users can customize their reading experience with CSS stylesheets. Hyphen also a big font library, with more default options than we’ve seen in other e-book reader apps for iOS. Highlighting and annotation tools are available and work well, but it requires a few taps to reveal the complete feature set. As we mentioned earlier, basic highlighters will find this trade-off appealing, but more dedicated annotators might find themselves tapping through a bunch of menus frequently enough to be annoyed. If you want to archive your annotations, they can be exported as an HTML file, a feature unique among the apps we tested. There aren’t a ton of downsides to Hyphen, but it doesn’t have the feature set we’ve seen in other e-book reader apps for iOS. And the justification algorithm can be a little funky, producing unsightly rivers of whitespace. In general, we found that a ragged-right alignment was a little more pleasant to read. Marvin is our favorite of the e-book reading apps for iOS. Kybook 2 and tiReader are almost as good, with tiReader offering a truly impressive feature set for those looking to study. Hyphen has a beautiful interface and is a great basic reader. However, it doesn’t have the additional features we found in other apps. But Marvin takes the crown despite its annoying nag banner thanks to unique specialty features like Deep View, Karaoke, and an ultra-dark night mode. 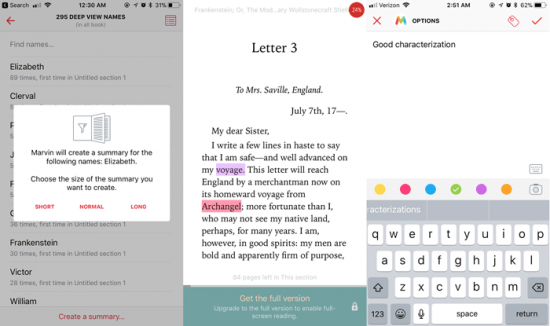 We also tried out many other e-book reader apps for iOS, but found them pretty disappointing, missing critical features we’d grown to depend on in other apps.